A pocket knife is one of the most versatile tools an outdoorsman or woman should own. They’re great for so many uses regardless of the activity: fishing, hunting, camping or need something EDC (everyday carry). They make a great gift for a brother, dad, friend (or yourself). Here’s the ShedHeads list of the best pocket knives you can get your hands on to choose from. This Benchmade knife is the first on the list for a few reasons. In our opinion, it’s the most beautiful of the five. The handle is curved and contoured to fit your hand comfortably, is perfectly balanced and did we mention it looks great? Beyond that, you probably already know that Benchmade produces some of the highest quality knives out there. 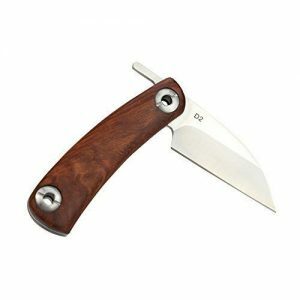 This pocket knife is in a traditional hunting knife shape but in a nifty folding design which makes it great for EDC. When fully open, there is no play between the handle and blade which is a testament to the craftsmanship of the knife, making it safe for even tougher uses. On that note, it’s an extremely sharp knife and stays sharp, so make sure you’re careful when using it. It’s on the more expensive side, but you’ll get a superior quality product that will last you years – plus Benchmade’s lifetime warranty will help. Next up is a Kershaw tactical-style knife. The modified “tanto” style blade is seen in tactical and rescue style knives and is designed to be able to pierce through tougher materials. The straight blade is strong and good for bearing down, and being easier to sharpen is an added bonus. The quick flipper allows you to open the knife quickly and and with one hand making it great for EDC. The handle is made of glass filled nylon (Zytel), which is a very strong and durable material, as well as being abrasion and heat resistant. The steel isn’t the hardest, and so dulls quicker than the Benchmade, but it’s great for what you pay for. Key Features: Tactical style, Zytel handle, straight blade, pocket clip, easy one-handed opening. Most folks don’t always need as strong a knife as a tactical model like the Kershaw or a hunting style like the Benchmade. Although this Outdoor Edge folding knife was primarily designed for fishermen, it’s got great versatility for other camping and every day uses. The handle is also made out of Zytel, making it strong and durable, but still nice and light. It’s got a nice texture that keeps a good grip even when it’s a little wet – perfect for the boat or camping. The light weight and size also makes it great for camping, backpacking or EDC. It may be on the thinner side for some uses, but this is a knife designed to be able to be a filetting knife first, and a versatile everyday use knife second. For the price it’s an awesome buy. The last knife on our list is this “Homefront” model by Columbia River Knife & Tool is an awesome option for a few reasons. First, the classic WWII style will have your grandpa asking you for one of his own. While it has an old-school look, it’s got a great and functional modern day design. Using their “field strip” feature, you can disassemble the entire knife into its components to properly clean the blade and handle without any special equipment or tools. The aluminum handles are better than wood or Zytel since you never have to worry about it breaking of cracking. This is one of our most favourite EDC knives because of the tactical look and ease of cleaning.